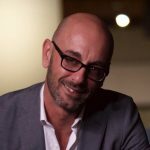 Armen Sevada Gharabegian is the CEO and founder of the Los Angeles-based robotics company, ShadeCraft, founded in 2013. ShadeCraft’s mission is to combine solar energy, robotic automation and artificial intelligence integration to change the way people live outdoors. A CEO for over 18 years, Gharabegian founded his first company, Ethos Design, in 1998. He has been involved in hundreds of projects worldwide, creating marketing solutions through exhibits and events for clients including Mercedes, Chrysler, Patek-Phillipe, Ubisoft and many others. Ethos Design also completed many industrial designs and environmental projects. In 2003, Gharabegian created Lounge22, a company focused on high end furnishing solutions for both exhibits and events. Lounge22 became a retail brand in 2009, providing both B-to-B and B-to-C opportunities. Gharabegian also created a series of signature furniture pieces as well as a multitude of environments that have been acknowledged for their design and execution. He has spoken at many industry events on subjects from green design to creative thinking. Gharabegian received both his Bachelor’s and Master’s of Science degrees in industrial design from Art Center College of Design in Pasadena, California. He was also a faculty member there for several years, teaching courses in exhibits and industrial design. Gharabegian is also a sci-fi author of the book “Protocol 7,” which was originally published in 2007.